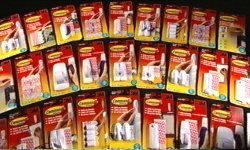 Once you’ve used 3M Mounting Products with Command Adhesive you'll be wondering how you ever lived without them! That’s because 3M Command lets you decorate and organize your home, whenever you like, and without marking your walls! 3M Command Adhesive hooks are the perfect solution for any home. Unlike traditional hooks that can cause damage, Command holds strong but removes squeaky clean… so you can let your decorative imagination run wild! There’s no need for drilling or holes. In fact, 3M Mounting Products won't cause any surface damage to walls or leave a sticky mess behind. With the 3M Mounting product range, there’s a hook for every occasion. Mini Hooks are ideal for hanging light objects like soft toys, barbies, ornaments and balloons – anything under 220 grams. Decorating Clips make hanging fairy lights a cinch. They're small, clear and almost invisible, so they won't stand out like a sore thumb. Medium Hooks will hold up to 1.3kg, making them perfect for hanging up towels in the bathroom or loose coats in a cupboard. 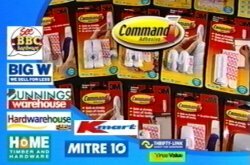 For the biggest household essentials you can’t go past 3M’s Large & Jumbo Hooks. They’re ideal for larger, heavier items such as laundry baskets. Large Hooks can hold weights of up to 2.25kg, while the Jumbo Hook can handle anything up to 3.4kg. For picture hanging, there are two types of hooks available - the Wire-Backed Picture Hanger for pictures hung by a wire, and the Saw-Tooth Picture Hanger for saw-tooth pictures. Both hooks can hold pictures weighing up to 2.27kg.